A user reported this issue when he tried to enter a cash receipt in CBM module. Following error message prevented him from continuing further. This error was confirmed to be happening only for one particular customer record. For all other customers, it worked. We basically do not have posting accounts setup for each customer or customer class. So it is absolutely no way due to missing posting accounts. Several minutes later, decided to compare customer records between this particular customer and one other customer that’s working. REASON: Customer Class ID for this customer record was wrong and was not part of the list of customer classes that we have setup on our company. Because this class ID was wrong, posting accounts validation stopped right there and threw a message that was totally irrelevant to actual reason. RESOLUTION: I changed the customer class ID for this customer with an existing one. User could then enter a cash receipt in CBM. Troubleshooting issues successfully is probably the best way to end a business day! 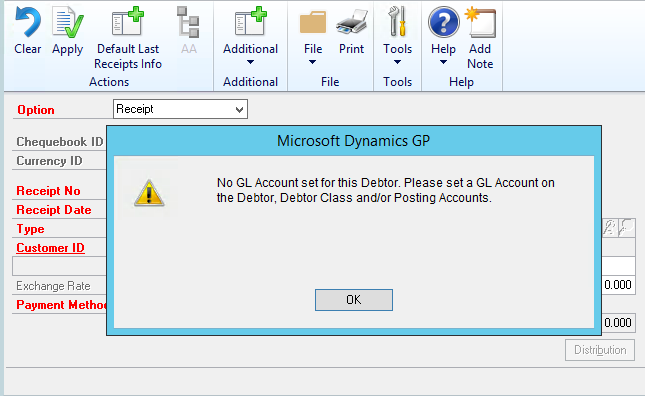 This entry was posted in #MSDYNGP, Cashbook, CBM, Troubleshooting. Bookmark the permalink. ← Where is the Support Debugging Tool for Microsoft Dynamics GP 2015?